How to Print Large Digital Photos That Look Good! If you have a digital camera and a color printer and you’ve printed 8x10 photos from your printer that look pixelated or blocky, then you’ll really like the product I recently started using. First of all let me explain the problem with printing large photos from digital cameras. Resolution! Resolution! Resolution! Resolution is the basic problem with digital photography. If you don’t capture enough pixels to print a large photo your stuck with what you’ve got. You can’t add data to the image once you’ve taken the photo. Therefore, the higher the resolution of the camera the larger the photo you can print. Over the last 5 to 10 years the resolution of digital cameras has increased dramatically. My first digital camera was a Canon that snapped photos with a resolution of only 640x480 pixels. With this camera, you couldn’t even print a decent 3” x 5” photo because of the resolution. However, back then, there weren’t really any affordable inkjet printers that could print color photos anyway. However, we now have consumer digital cameras that can capture images up to 2048x1536 pixels (3.1 million pixels) for around $1000. These cameras can print high quality 8x10 photos on a good photo quality inkjet printer. Currently I’m using an Olympus C2500L camera, which has a resolution of 1712x1368 and I have been able to shoot some incredible shots and print very good-looking photos on a relatively inexpensive color inkjet printer. Some really nice photo quality inkjet printers can now be purchased between $200 and $500 depending on the output size of the printer. Of course the ink refills will cost you a lot over the long run, but you can print really sharp photos at home without having to pay for expensive enlargements. In order to print high quality images, your camera has to capture a high quality image in the first place. So the thing to look for in a camera is how much compression does your camera use when saving photos. Most digital cameras use some sort of compression when saving their image files and they typically using JPEG compression. However, some of the newer cameras support uncompressed TIFF images like the Nikon Coolpix 950 and 990 and the Olympus C2500L, C2000 and C3030 cameras. The important thing here is that if the camera uses too much compression, you will notice artifacts or blocky pixels in your printed photos, especially if you enlarge them. So the key to printing large images is to use low compression or no compression when shooting and saving your photos. The Olympus cameras use a low 2.3:1 compression when saving JPEG images using their Super High Quality mode and this produces about a 1.7MB image file size using JPEG and translates to about a 6MB image size using TIFF uncompressed mode at a resolution of 1712x1368. However, the SHQ JPEG images are very close in quality to that of the TIFF uncompressed images. Any cameras that use JPEG compression higher than a 3:1 ratio will have noticeable artifacts in the images when zoomed to 100% on your computer screen. 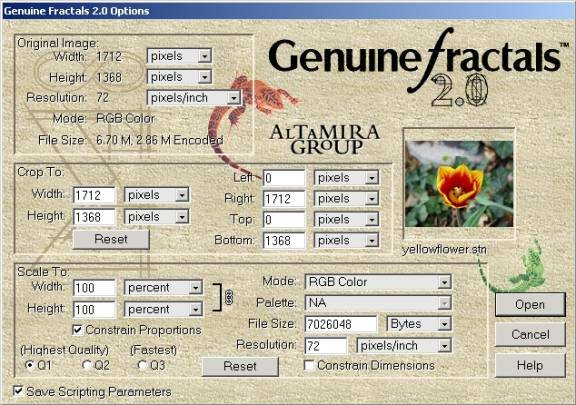 Now there is a way to get around the problem of printing large photos without using ultra high-resolution cameras using a software plug-in called Genuine Fractals 2.0 from Altamira Group. They can be located on the web at www.altamira-group.com. This product has been out for a few years now and has won many awards. I just hadn’t had the time to try it out until recently. When I did, I was so impressed that my wife told me to buy it. She was obviously impressed too. So how does it allow you to print large photos? Genuine Fractals is a plug in that can be used in PhotoShop or any compatible image editing software application like Jasc’s Paint Shop Pro or Corel Photo Paint 9.0. When the plug-in is added to the image editing software, you are able to save your images with an STN file extension using the “Save As…” option. This is Genuine Fractals proprietary file compression format. It saves the information about the picture into a resolution independent file. When you save your image using lossless compression the image size is about 50% of the original. If you save the image using their visually lossless compression, the image size will be about 20% of the original size. Now, when you open your image in the STN file format you are prompted with the screen shown below. This screen allows you to rescale and crop your image to whatever size you want. I have scaled images up to 500% which means that I could have printed them on a 6 foot poster and have them still looking good. (Note: Poster size printers run about $16,000 - $20,000. However, it’s nice to dream!) When you rescale your image, it will take a while for the software to perform the computations, so be patient. But when it appears on the screen, you’ll be amazed at the quality with the size of the image that you’ve created. This results in about a 300MB image file size while working with it in your image editing software. Below is a chart giving the approximate sizes for printing images at various resolutions for reference. The higher the pixels per inch (ppi), the better the image quality. If you want to print larger than 5”x7” or 8”x10” photos from your digital camera using your color printer, this is the way to go. If you also want to archive a lot of your photos to a smaller file size but still retain all of the quality of the original image this software plug-in will also do the trick for that as well. Also, if you have other friends that have this software you can send them high quality resolution independent images at a fraction of the size across the internet for them to rescale and print at virtually any size. The software costs $159 direct from Altimera. There is even a downloadable demo that you can use up to 20 times to try it out before you purchase it. I’ve been able to print photos up to 13”x19” on an HP Deskjet 1220c using premium photo paper that achieve nearly the same results as a normal chemically processed photo enlargement using this software. It’s a must have for the hobbyist or serious digital photographer.